Einfach links die Klippe runterspringen und dabei KEINE Flugfähigkeiten verwenden (Gleiter etc). Man wird von einem Pterrordax in der Luft abgeholt. It makes sense the he is friendly with the Trolls. Pa'ku makes you jump off a cliff, then is just like, "j/k lol, just seeing if you would do it." Literally, just jump off the edge, once you've spoken to her! Where do you pick up this quest? It is on my map, but I can't get to it. Updated with the cords from Acps! For anyone who did what I did. Bargained with Pa'ku, walked away, started different quest lines, then have no idea what to do when you have a quest that simply says, "Jump off the cliff". Go to the circled area and you'll see Pa'ku. Jump off the cliff behind it. Cords are 71.8, 49.3. He will catch you while you're falling, so don't worry about dying. Selecting Pa'ku appears to provide the player with totems (see screenshot) scattered around that will give you a quick lift to higher elevations. These seem to be near flight points generally from what I've seen so far. Ride the Schwingenfürst Ata behind the questgiver. He will bring you to Pa'ku (hover for map) in Pterror Rise. Speak with Chronicler Ash'tari to switch loa later in Dazar'alor if you want to. This quest is the final quest of the The Zanchuli Council questchain of Der Thron von Zuldazar <= more info inside or look under the spoiler. If you are coming there by foot for some reason, start from the Warbeast Kraal flight point. Take the road to the south-east, the only road going up the mountains. On the end of that road you will see a huge Pterrordax Loa. I jumped of from /way 71.8 49.25 and it worked out fine. "Haha! I did not mean that literally." Yeah right. To reach Pa'ku ride Schwingenfürst Ata nearby the quest giver. After getting into the nest talk to Pa'ku. it will order you to jump off the nest. You have to jump off, but if you jump not far enough, you may hit the ground and lose much hp. Ya know.. at least the old/defunct Thousand Needles quest didn't actually let me die. Pa'ku probably cackled as only a giant flying dinosaur can. Which is fair, considering they're a Goddess of Giant Fying Dinosaurs... what am I complaining about, again? anyone else not able to accept this quest? I am at Hexlord Raal but there is no quest. I killed Dregada, chose a Loa, then nothing. Just standing here. If you like me happened to fall down and end up dying before reaching the nest, the easiest way to get back is to take resurrection sickness, abandon the quest and then fly to The Sliver. The quest should be marked on your map so you can just walk back and pick it up and get a new flight to try again. what if you picked the wardruid loti how do you get this quest? I originally chose the Gonk pathway and completed The Zanchuli Council requirement through that. Is there a way to do the Pa'ku line? It keeps persisting as an "!" on my mini-map and I wanna get rid of it but when I go to that area, there is nothing to be picked up there. I could also use the +75 rep for it! EDIT: Just when I posted this, I went to turn in another quest at King Rastakhan at the top level in Dazar'alor and Hexlord Raal is standing next to him offering the quest. The "!" 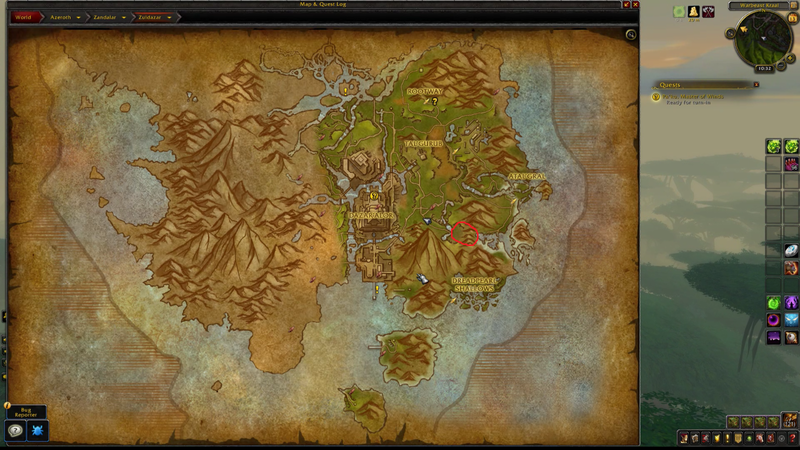 on the mini-map was near the original location that the quest was offered but to go back and pick it up, you have to go to where King Rastakhan is. My guess is it would work the other way around as well for those who did Pa'ku first and want to complete Gonk for rep. If you fall before you complete this, get back to Warbeast Kraal. Zoom in on your map and you should see the path back up to here. Be sure to follow the map carefully. There is a false path that leads you in a circle of you don't follow the road exactly. If you're trying to pickup the quest after you dropped it in frustration, there's a Paku statue at the base of the stairs leading up to the Pteros. There will be a mounted guard and four Zandalari on foot. Click the statue and you'll be taken to the top of the temple, just climb some stairs and talk to the NPC. This is also a great way to get there if you didn't jump and need to get back. First things first, Pa'ku is above where you land, he is not below you so make sure you go up and talk to him before you jump off the cliff. How to actual FIND Chronicler Ash'tari if you took Gonk and want to just change to Pa'ku. No quest required. From the flight master Paku'ai Rokota, travel down the stairs down two levels. She is stood by the stairs on the right, near the Altar by Loa Speaker Jen'ka and Raptari Galo'way. Speak to chronicler Ash'tari in order to change your Loa between Gonk and Pa'ku. Both Loas will grant use of Totems throughout Zuldazar which give you either a 30second buff or a small flight path. Pa'ku Totems - Small and direct flight paths to set places in zuldazar dependant on which totem you use. Pa'ku saved me from falling to a gruesome death, but my poor innocent voidwalker was allowed to keep falling eventually smashing into the rocks 600 feet below. Murder, that's what I say, elemental murder. Geht mit Pa'ku einen Handel ein. Kommt, reitet auf Schwingenfürst Ata un' lasst uns Pa'ku aufsuch'n. Un' benehmt Euch in Gegenwart des Loas. Pa'ku hat schon Anhänger, die sie nich' leiden konnte, aus sehr großer Höhe auf sehr harte Felsen fall'n lass'n. Oh, sehr gut. Sie hat Euch also nich' fall'n lass'n. Ein gutes Zeichen. Kommt, lasst uns allen Eure Wahl bekannt geb'n.